Can you hear it, it's the sweet sound of contentment emanating from my sewing room. It's like a retreat, except it's going on in my sewing room, no drama, no math, just simple sewing and trimming. I'm ready to make some James River Blues blocks, everything I need is right here. 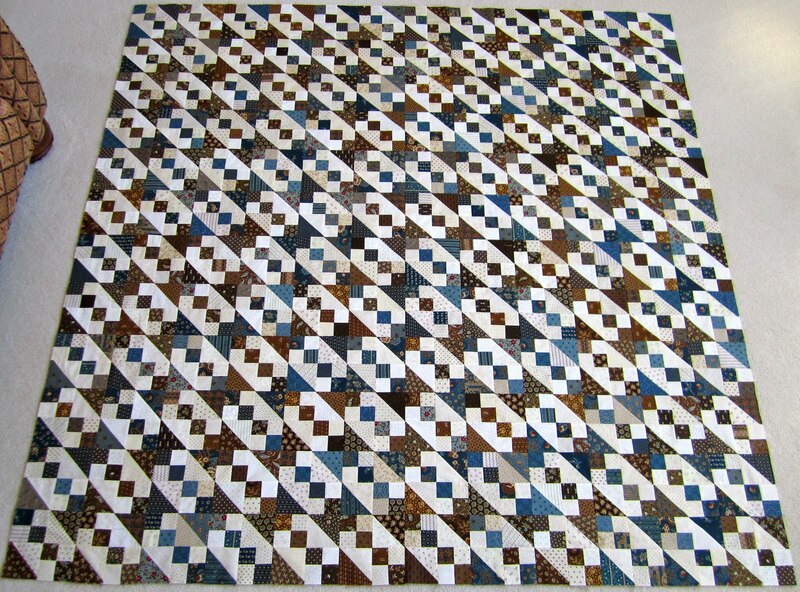 I'm making 144 blocks and have decided to make 72 blocks with a random assortment of browns and blues. 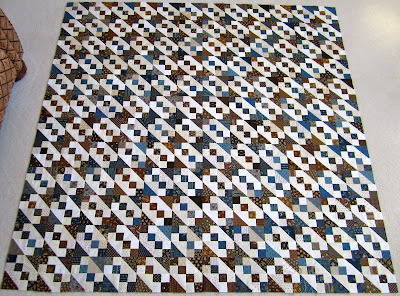 Of the remaining 72 blocks I plan to make 36 all blue and 36 all brown. I sure enjoyed reading all the Schnibbles comments on my last post. Bec suggested using Sweetwater's Hometown for Full House, I like that idea and may just copy it! 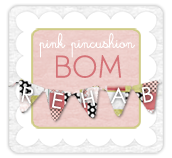 And I think Gretchen said what I was thinking but just couldn't put into words, " They are so addicting and a perfect way to get a wonderful fabric line out of your system. You know those lines that you just gotta have but don't really need a big quilt made of it." Thanks for stopping by and sharing your Schnibbles stories with us. 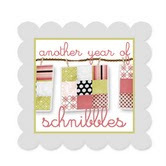 We are a wonderful assortment of Schnibbles lovers, I'm pleased to be in such wonderful company!! I'm also glad to know that a few folks agree with me when it comes to the name on this pattern, I may have to start an official campaign of some sort, stay tuned for updates! Nancy E who has made 6 Schnibbles and left a comment on 9/9 at 5:55 am. Paulette at Sweet Pea Quilting and Creations who has made only 2 Schnibbles, even though she has plenty of wall space. I think there are more in your future Paulette. Paulette's comment was left on 9/9 at 9:05 am. Kristen at Meadowbrook who is struggling with Honeycomb but not giving up on Schnibbles! Kristen left her comment on 9/9 at 6:44 am. I'll let you know what Schnibbles they pick! Are you a Schnibbler? I'm a Schnibbler! 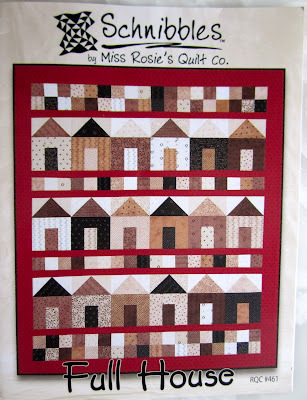 Schnibbles are mini quilt patterns that use a couple of charm packs and a little yardage to make an amazing work of art and are the brain child of Carrie Nelson at Miss Rosie's Quilt Co. 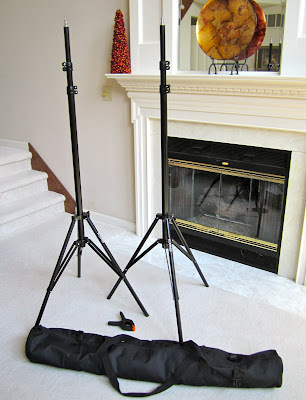 I had only been blogging for a few weeks and was so excited to get to participate in my first sew along. The first Schnibbles for the sew along, "Winter White"! 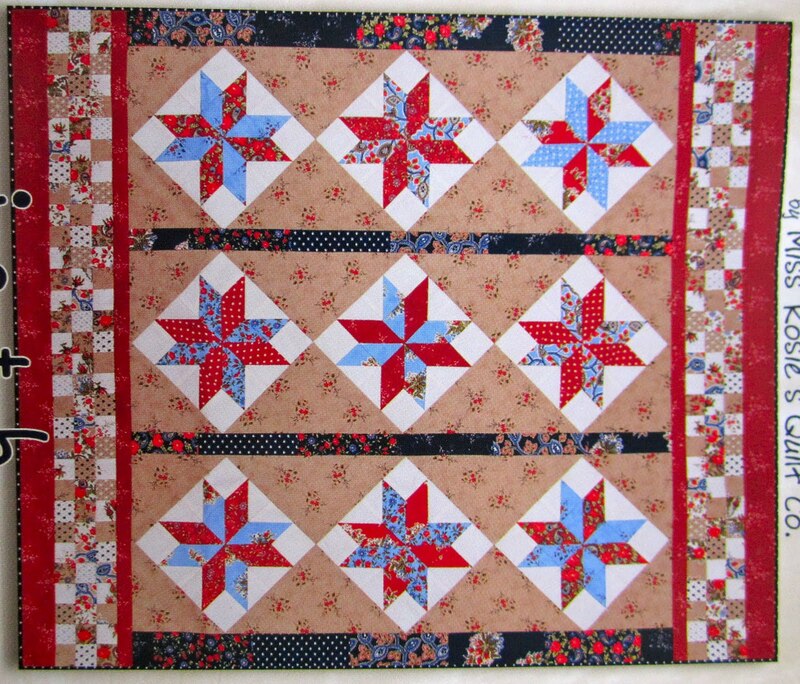 Since that time I've made 4 Schnibbles, maybe I should say I used 4 Schnibbles patterns to create some quilts. The main reason I kept tinkering with the patterns, besides the fact that I'm a nut who always has to be just a little different, I didn't have any place to hang those mini quilts. And even though I have 7 or 8 quilts stacked on one bed, one on top of the other, they are still bed quilts and serve a purpose. I just couldn't talk myself into making little quilts, even if they were adorable, if I didn't have any place to put them. And it drove me crazy, what a great way to use up scraps, to experiment with fabric choices, to learn some new techniques, by making Schnibbles. 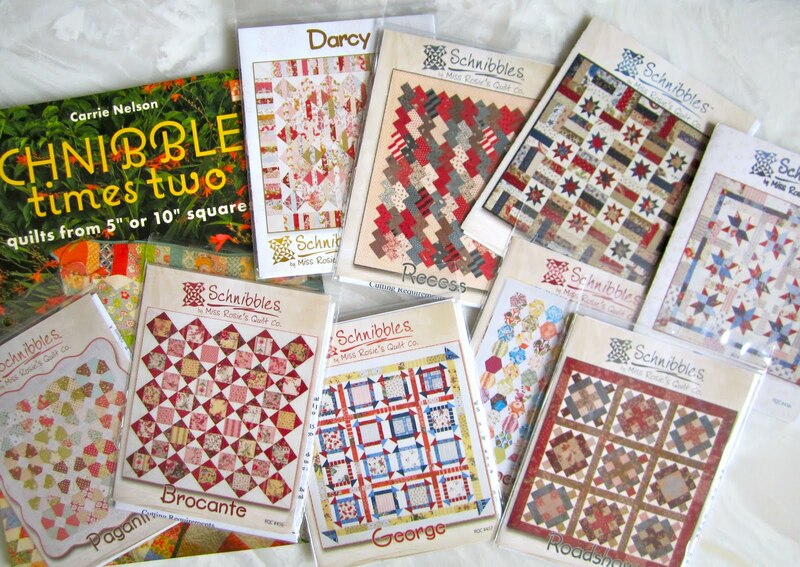 And while I was able to resist making Schnibbles, that didn't stop me from buying the patterns. They are like candy to me, a real treat! I love reading them, love finding out how they go together, love the math that makes up the designs. They're better than a Sudoku puzzle. 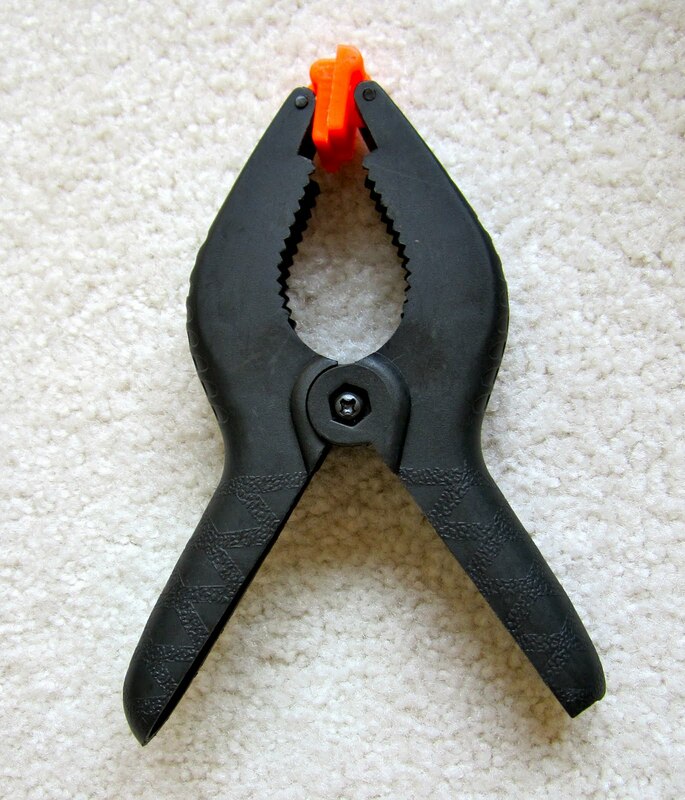 Plus they are portable, I stick one in my purse and read it when I have a spare minute. I actually left Nash at the dentist's office. When the receptionist called to tell me I had left it behind, and wanted to know where she could buy the pattern, I just gave it to her. Once I've figured out the "man behind the curtain" I'm pretty much done with them. It's like those find the differences in two pictures puzzles, once you've figured it out, you're ready for the next one. Well all that's changed! This summer I replaced the bedroom outfit in my guest room. And I intentionally didn't order a mirror to go over the dresser, I'm filling that space with Schnibbles! What a perfect place to hang mini quilts, that dresser stretches out 66 inches long and Schnibbles usually run less than 40 inches square. 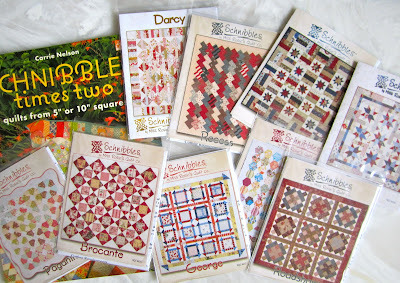 I just got the latest 6 new Schnibbles patterns in the mail and can hardly wait to make them all! One of my favorite things about Sherri and Sinta's sew along is the monthly parade, where all the projects for that month are revealed. I just love seeing the same pattern made with different fabrics, I am always in awe of the projects that are in that parade and the fabric combinations that folks use. 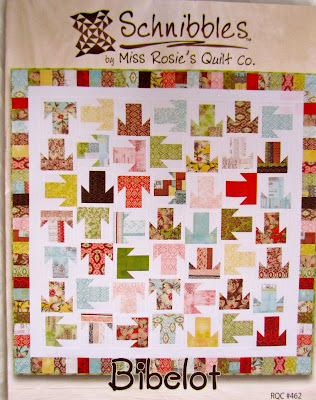 Well Carrie has created her own Full House Parade, click here to see this pattern using 4 different families of fabric and two different pattern sizes! 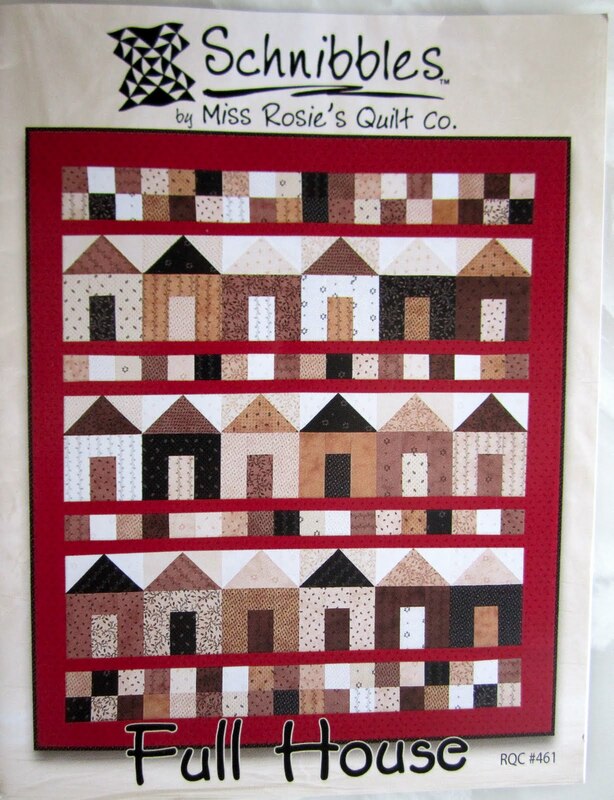 House blocks in quilts always appeal to me, I have a few houses in a Thimbleberries Christmas quit, but this one is better, a whole little town! This pattern is called "T stands for Thelma" I'm not sure why the cover says "Bibelot", the back of the pattern says bibelot is "a small object of curiosity", I'm not small but I am sometimes an object of curiosity. I'm going to make "T stands for Thelma", I hope you do too. 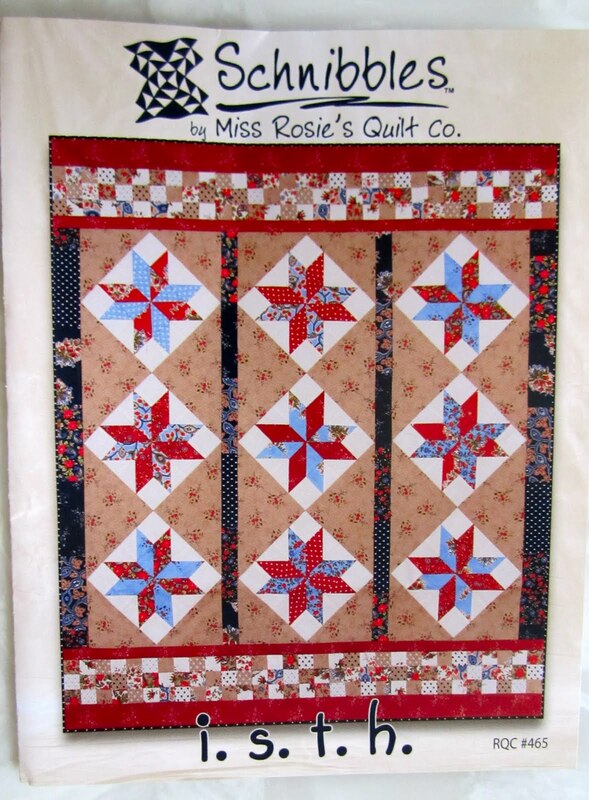 This is "insert snappy title here", maybe we could call it "Bibelot" and get the right name on "T stands for Thelma"
When I make this quilt I'm gong to hang it like this, because I think this is the way it's meant to hang. 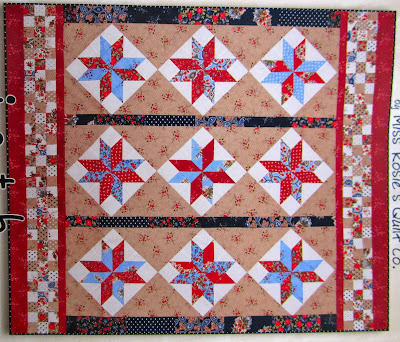 "Summer Day" out of light, bright fabric, how about Fall Day out of Sandy Gervais, or Winter Day out of Countdown to Christmas or Spring Day out of Fig Tree, the possibilities are endless!! These are the last two of the latest Schnibbles patterns, I've yet to read the directions but just know Carrie has come up with a clever way to make these complicated looking quilts go together easily. 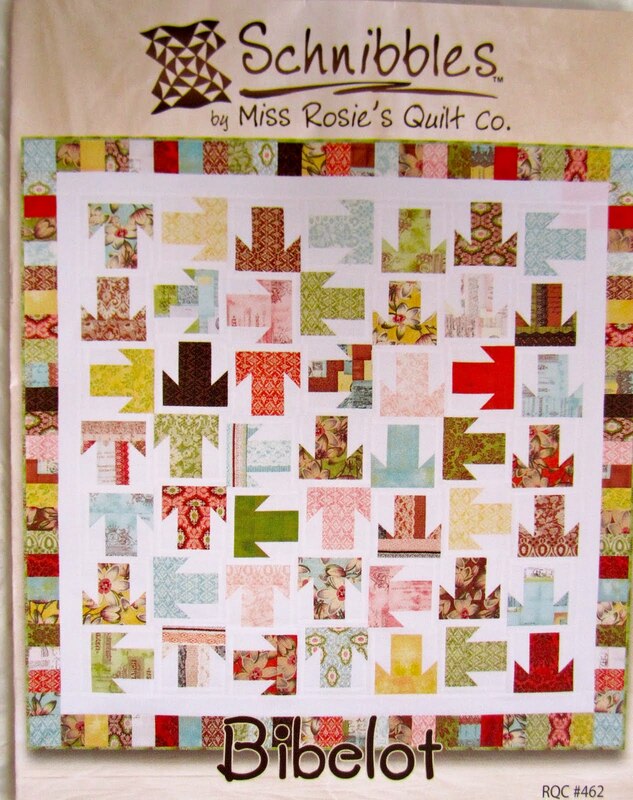 Sinta and Sherri have decided that September is quilter's choice month. We can make ANY Schnibbles pattern we choose, I've been waffling on my choice for days now and have still not made up my mind. But as soon as James River Blues is done I'm starting on my Schnibbles, you'll just have to come back by to see which one. I sure hope you participate in this month's Schnibbles parade too. To give you a little incentive I'm giving away 3 Schnibbles patterns of your choice to 3 folks who leave a comment or send me an email. New, old I don't care, which ever patterns call your name they will be coming to your house. Any comment about Schnibbles will do, like how many you've made, why you've not made any, why you like Schnibbles, why you don't, your favorite (my favorite is Picnic) just share a little Schnibbles trivia and you're in. You have until 5 am, CST on Monday, September 12th to leave a comment, I'll announce the winner later that day.